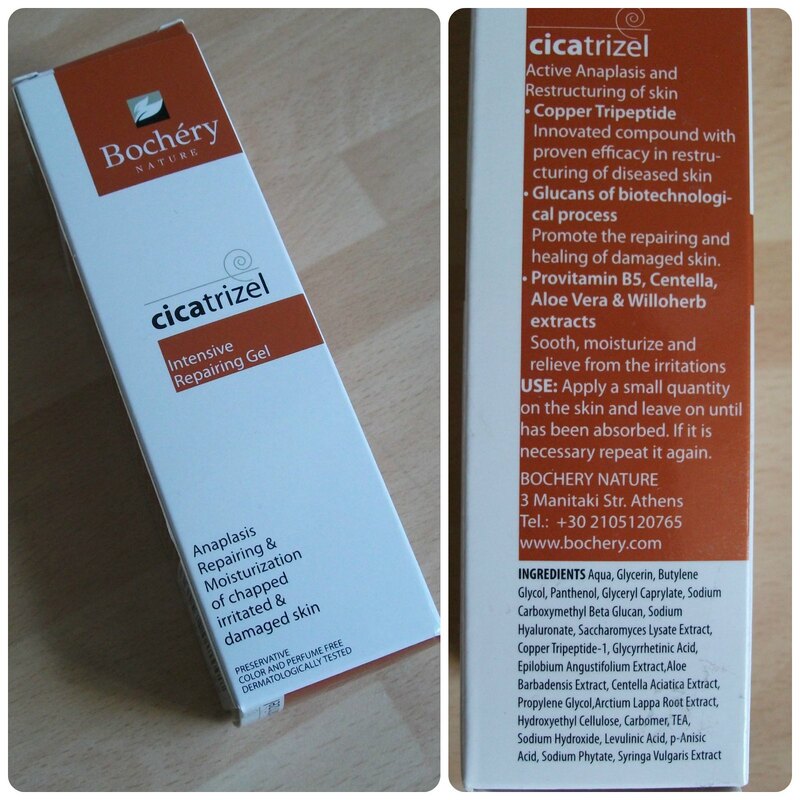 I was sent Bochéry's Cicatrizel Intensive Repairing Gel* quite a few months ago now, and it took me quite a while to get round to trying it, simply because I wasn't sure how to use it; on reflection, if I'd read the packaging properly in the first place, it would have been glaringly obvious! "Anaplasis Repairing & Moisturization of chapped, irritated and damaged skin" is actually a pretty conclusive description of the product's purpose, after all. Marketed as a wound healing gel, Cicatrizel claims to give, "Active Anaplasis and Restructuring of skin. Copper Tripeptide: Innovated compound with proven efficacy in restructuring of diseased skin. Glucans of Biotechnological Process: Promote the repairing and healing of damaged skin. Provitamin B5, Centella, Aloe Vera & Willowherb Extracts: Soothe, moisturise and relieve irritation. Use: Apply a small quantity on the skin and leave on until absorbed. Repeat if necessary." The outer packaging consists of a white card box printed with all the product information and ingredients; within the box is a white plastic tube with silver screw cap, again printed with product details, though lacking the ingredients list which is a shame. The screw cap is hygienic and makes the product, a transparent gel consistency, easy to dispense. The lightly-scented gel spreads and rubs into the skin easily, leaving a slightly sticky feeling which has absorbed fully within a minute or so. 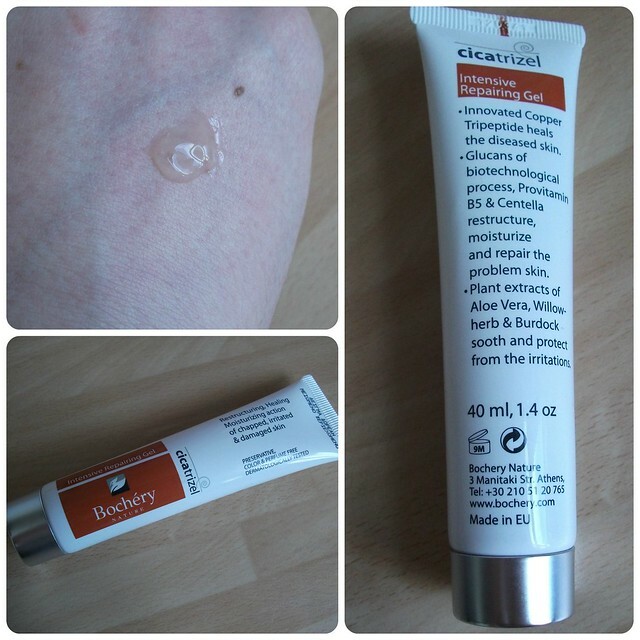 I've been using Cicatrizel mainly on my hands, as my new job has been quite tough on my skin and I've been suffering with a flare-up of eczema on my hands. I've found that Cictrizel leaves my hands feeling softer and more moisturised, and regular use has definitely reduced the amount of irritation present. Cicatrizel is recommended for use on acute and chronic skin wounds, for example following surgery, burns, pressure ulcers and so on. Obviously none of these apply to myself so I can't say how effective it would be in those instances, but in terms of soothing and moisturising the intensely dry skin on my hands it has made a noticeable difference which would make me more than willing to give it a go for more major concerns such as the wounds mentioned. It's recommended for use 3-4 times per day, which is roughly how often I've been using it, though I have been using it in combination with a regular hand cream at more frequent intervals. All in all, I feel Cicatrizel has worked reasonably well in moisturising and repairing the damaged skin on my hands caused by eczema. Priced at £22.95 for 40ml of product, Cicatrizel is available directly from Bochéry's website, with free UK delivery on orders over £50. I'd definitely recommend this if you're having some kind of surgery or have suffered a serious burn or other acute skin wound; it's quite expensive for what is essentially, to me, a hand cream, so I don't think I'd repurchase this particular product. I'll definitely be looking at trying some other Bochéry products, though! Have you heard of Bochéry? Have you tried any of their products? Do you think you'd use a product like Cicatrizel? Sounds like a good product. You have an interesting blog, I like it. Never heard of this brand. Sounds like a good product though.